Corporate credit growth in China has been excessive. The debt problem should be addressed urgently with a comprehensive strategy, trading short-term economic pain for larger longer-term gain. How much is too much? Private sector credit growth in China has been fast, rising by 80 percentage points since 2008 to reach about 175%t of GDP in 2016 (CEIC and IMF staff estimates). Market commentators have been trying for years to call when and how China’s credit boom will end. For some, the rapid dynamics are an ominous sign of a coming crash. Borst (2013) showed that by various measures, credit grew excessively and by 2013, was already at a level highly correlated with subsequent financial distress. Others see the glass half-full, pointing to the vast array of instruments and resources available to the state to deal with excess leverage. Huang and Bosler (2014) recognized the debt problems, but argued that they could be addressed with prudent macroeconomic policies and productivity-enhancing structural reforms. Divergent views still fill market commentaries. The problem with a solution. In our recent paper (Maliszewski et al., 2016), we recognize complex interactions between China’s growth and credit expansion since the global financial crisis and point to policy challenges to bring down excess leverage. We find that credit-related vulnerabilities can still be tackled while maintaining healthy growth, but that will require a comprehensive strategy and quick action. Credit gap has been wide. We estimate that the credit-to-GDP ratio (solid line in Figure 1) was 20%–25% t above the level consistent with the historical trend (dotted line) at the end of 2015—a potentially dangerously high “credit gap” (distance between the two lines). 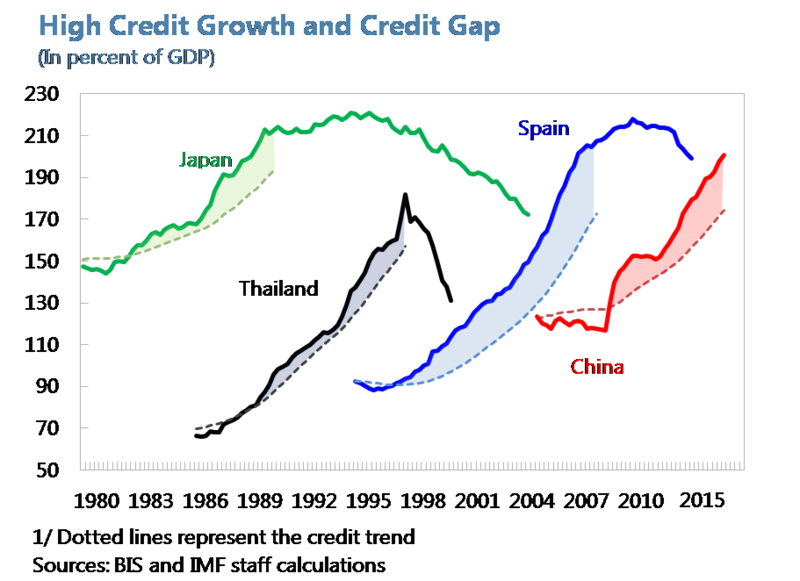 The gap is comparable to countries that have experienced painful deleveraging, such as Spain, Thailand, and Japan. Excess credit growth has been in the corporate sector. The rapid increase in credit could reflect financial deepening in a fast-growing economy. 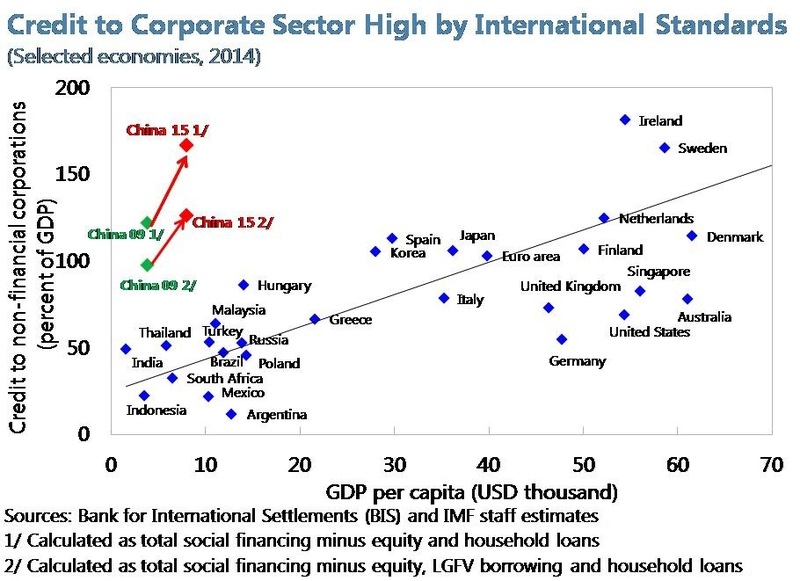 But Figure 2 shows that the credit-to-GDP ratio for the corporate sector is significantly higher in China than in countries at a similar level of development and even exceeds levels typical for developed economies. The debt trajectory has thus been above the normal path of financial deepening. Corporate sector needed credit to finance the rise in investment after the global financial crisis. This helped boost domestic demand amid the collapse in external trade, helping China and the world. Credit financed broad-based scaling up of infrastructure spending and real estate investment, which in turn supported rapid development in upstream industries such as steel, cement, and coal. But the use of capital has become less efficient, hitting financial results. At the “macro” level, the “efficiency of credit” (incremental GDP growth relative to incremental increase in credit) has been declining as growth payoffs from additional capital spending have been falling (Figure 3). At the “micro” level, this has translated into steadily falling returns on assets and increasing leverage ratios (Figure 4). Overall, this suggests deteriorating debt servicing capacity, which is most pronounced in real estate, construction, and related upstream activities now suffering from overcapacity. 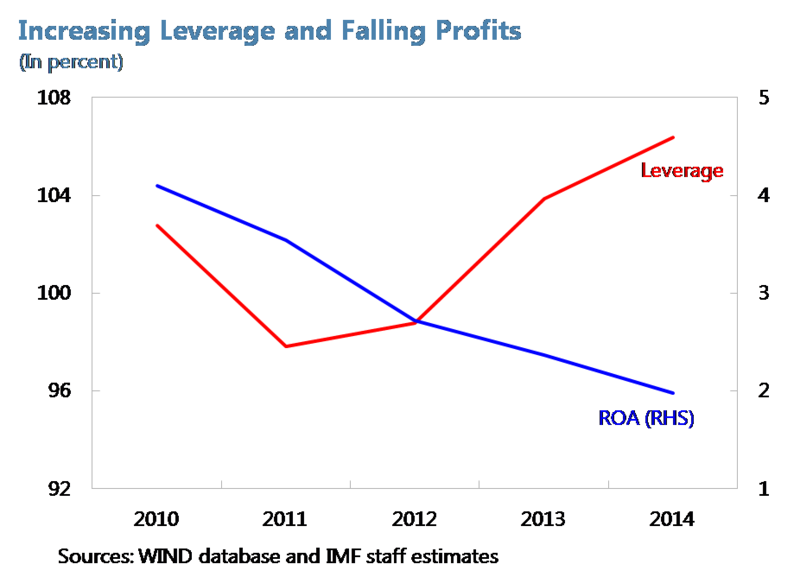 SOEs have been more leveraged and less profitable than the private sector. SOEs acted partly as a conduit for policy-driven investment, accounting for three-fourths of the rise in corporate debt/GDP since the global financial crisis (Lam, 2017). The rise has been enabled by soft budget constraints, with implicit government guarantees facilitating access to cheap financing from state-owned banks. Staff estimates suggest that such guarantees translate to a 4–5 notch upgrade in credit ratings and appear to lower borrowing costs by about 1–2 percentage points. As borrowing costs are not commensurate with true returns and risks, they distort the allocation of resources and promote inefficiency. Credit quality of banks has been deteriorating accordingly. Reported non-performing loans and special-mention loans remain low (at about 5½% of total loans) and manageable given banks’ buffers, but they have been on the rise. Moreover, our estimates based on corporate data suggest that potential “debt-at-risk” amounts to 15½% of the total corporate loan portfolio, which could yield an estimated potential loss of about 7% of GDP (when applying a 60% loss ratio on these loans; see Maliszewski et al, 2016 for details). 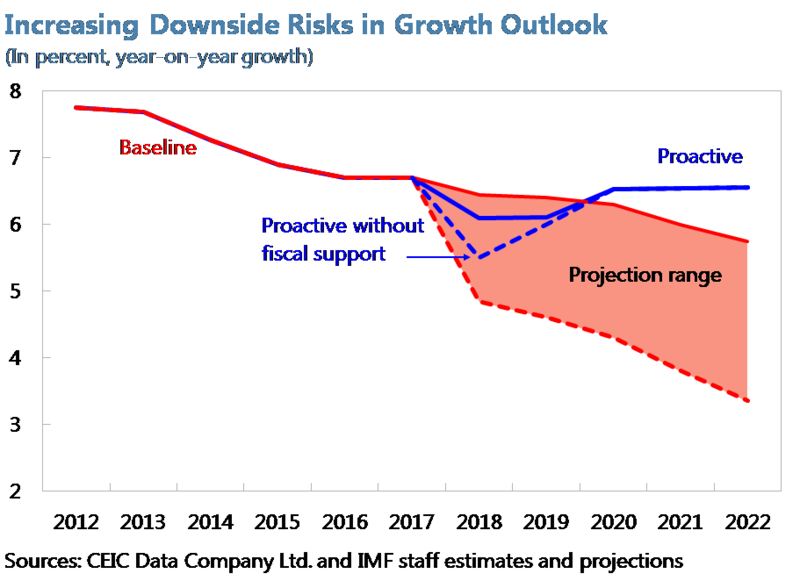 Without reforms, growth prospects would deteriorate and financial risks increase. For now, banks have a strong incentive to lend to weak enterprises as they do not want to trigger defaults and recognize potential losses, and they believe that those companies—particularly SOEs—will be bailed out in case of difficulties. Furthermore, local governments support weak local firms as they fear social consequences of defaults and job losses. If this continues, economic growth would remain high in the near term. But vulnerabilities would rise over time and growth would moderate over the medium term to below 6%, as soft budget constraints would continue to encourage further misallocation of resources. Moreover, the probability of a financial crisis in such a credit-propelled scenario would increase, and growth could dip to below 3% if such a disruptive adjustment happened (Maliszewski et al., 2016 and IMF 2017). China needs a comprehensive strategy to address the debt problem.  A comprehensive strategy should include identifying companies in financial difficulties (triage), loss recognition, and debt workouts with appropriate burden sharing to minimize moral hazard. Corporate restructuring and governance reform, including hardening budget constraints (particularly in SOEs), should also be among key elements. 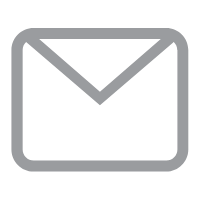 In addition, supporting policies should include enhancing the legal framework, improving local government fiscal discipline, and minimizing the hit to near-term growth and employment. Such a strategy would have short-term costs, but would be more than offset by long-term gains. With comprehensive corporate restructuring, growth would slow in the near term, but then recover (blue line in Figure 5). The slowdown would be driven by output and employment cuts in overleveraged and overcapacity industries. This would have social costs (and would require support to the most vulnerable). But it would gradually give way to higher production and employment as labor reallocates, partly to services. The reallocation would produce higher and more sustainable growth in the future, with less investment and credit, but higher total factor productivity growth. The staff simulation shows that growth would temporarily dip to 6% (assuming fiscal support to the most vulnerable), but would pick up sustainably afterwards. The government is committed to reducing corporate leverage. The government has issued guidelines to broaden the number of tools that firms could use to restructure their debt, has introduced a range of prudential and administrative measures to contain financial sector risks, and has identified zombie SOEs, reduced overcapacity in the steel and coal sectors, and strengthened control over local governments’ finances. But, as the IMF argued in its latest report (IMF, 2017--link to the forthcoming IMF staff report), now is the time to intensify these deleveraging efforts, while growth momentum is still strong. Borst, Nicholas, 2013. 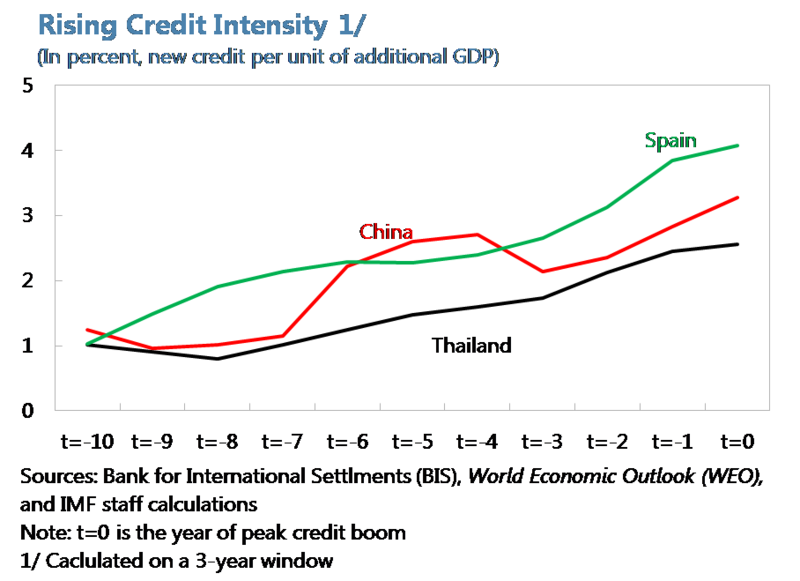 “China’s Credit Boom: New Risks Require New Reforms,” Policy Briefs PB13-24, Peterson Institute for International Economics. https://ideas.repec.org/p/iie/pbrief/pb13-24.html. Huang, Yukon and Canyon Bosler, 2014. “China’s Debt Dilemma: Deleveraging While Generating Growth,” Carnegie Endowment for International Peace, September, http://carnegieendowment.org/files/china_debt_dilemma.pdf.